This ship-shaped, pirate-themed puzzle brings the high seas to life. 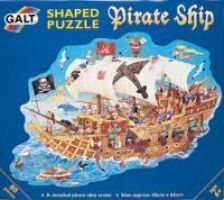 Flying the old skull and crossbones, the ship shown in the finished puzzle is full of merry pirates and daring deeds, just waiting to be discovered. With 80 pieces, ye might want to secure some ship's rations before ye get started!